I was born in 1966 in Flint, Michigan, during the height of the American “Baby Scoop” Era. My birthmother and father were unmarried teenagers, and my grandfather was a local TV news anchor, with a reputation to uphold. Adding to the lack of parental support was the fact that my father was Jewish and my mother was not. “Mixed” marriages were not very common at the time. In a strange twist, my birthmother ended up marrying a Jewish man 20 years after I was born, and converted to Judaism. The irony of her converting, years after she gave me away because she was a shiksa, is not lost on me. She certainly did have a thing for Jewish guys, at any rate. Like many other adoptees, things looked very good on paper in my adoptive home. Nice family, nice home, financial stability and a bright future. All my physical needs were met. Emotionally, it was a much different story. I have moved to a place where I can forgive my adoptive family, but I did suffer abuse there. Coming to terms with it now, and being honest with myself about what happened to me, is necessary for me to keep healing. I have to talk about it and share with others in order to get the support I need. The abuse was largely psychological, but not always. In 1988, I met my birthmother. At that time, post-adoption reunions were fairly rare. I was part of the first wave of “Baby Scoop” Era adoptees to search. There were no directions, and no advice on how to handle the emotional mess that accompanies reunion. No guide posts at all. In fact, most therapists at the time still operated under the assumption that if you had problems with being adopted, it was your own fault. Unfortunately, many therapists, some of whom are adoptive parents themselves or have family members who have adopted, still adhere to this belief. I was lucky enough to find a therapist who understood that adoption equals loss for the person who was adopted. She understood that basically all adoptees have PTSD to some degree. I had big expectations of my reunion. Having been without a loving bond with my adoptive mother for my entire life, I was desperate for it. I craved closeness with her like someone desperate for oxygen. I brought her into a therapy session once because I thought it would help us have a better relationship. I fully understand why it was hard for my birthmother to deal with our relationship. It was clear to me she was wrapped in a straight jacket of shame over her decision to relinquish me. Something obvious, that happened early on, was her seeming unwillingness to be alone with me. Even though I asked her to spend time alone, every time I saw her, there were always other people around, hyperactive dogs, and a blaring television set. It felt very chaotic, and it seemed she wanted to keep me at a distance just as much as I wanted to keep her close. A few years after I met her, I began suffering from migraine headaches. I woke up one morning in 1994 with a headache that simply never went away. The intensity of the pain would vary from mild to severe, but it did not really go away completely until I was almost 50. I learned my birth mother also suffered from debilitating migraines. For the first time in my life, I was able to get some of my family medical history. If I had known at that time that we would end up estranged, I would have gotten more. In March of 2004 my biological sister died very suddenly. She was 34 years old and had two young children. Three days later, my adoptive father died, also very suddenly. This was a pivotal time in my adoption journey. I really felt as though the earth was quaking under my feet. I had to come to terms with the adoption trauma and pain that was at the foundation of my being. A year after my sister, her daughter, died, my birthmother stopped contacting me. I was very fragile emotionally, and frankly, I was grateful to take a break from the relationship. No matter what I did, I found myself feeling deeply depressed after I had any sort of contact with her. As hard as I tried, I just felt sad at the decades lost, never to be regained. Seeing the closeness of the whole family, and the shared memories that could never be mine, exacerbated my profound feelings of loss. I felt I did not belong anywhere. I never heard from my birthmother again. My health problems grew worse. The headaches were constant and I spent lots of money and countless hours in doctor’s offices. I was given diagnosis after diagnosis, and drug after drug. I took anti-seizure drugs, anti-depressants, anti-anxiety medication, sleep medication, and pain meds, including opioids. The side effects were intolerable, and the medicine rarely gave me any relief. My pain became more widespread, and I was diagnosed with fibromyalgia. My back pain became quite severe, which was doubly problematic because I was working as a psychotherapist. My job required me to sit in a chair for hours, which the worst thing one can do with a bad back. I continued to work as much as I could, in spite of the pain. I was raising my two daughters, and also went through a difficult divorce. The stress was immense, and my symptoms worsened. Two years ago I was taking a music lesson. I was doing some warm up exercises and bent over to touch my toes. As usual, I was able to place the palms of my hands flat on the floor, which I did not know was atypical. My teacher asked me if I had EDS. Ehlers-Danlos Syndrome. A rare genetic disorder characterized by joint hypermobility and widespread, chronic pain. EDS affects all the connective tissue of your body, and connective tissue is everywhere. Your skin, muscles, ligaments, nerves, and digestive system, among other things, are all connective tissue. Luckily for me (but not for her,) my music teacher has EDS. That’s how she was able to guess what I had. I went to see her specialist, and she was right. I went to doctor after doctor for decades, to no avail, only to have a random friend toss out the right diagnosis after watching me bend over. I have learned that EDS is most often passed from mother to daughter. The doctor also evaluated my daughters, and they both have it, as well. It’s difficult to say how much having a full family medical history would have changed the progression of my illness. But there is no question it would have helped a great deal. 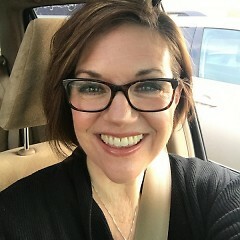 I’m going through menopause right now, and have no idea to expect. There is no time in your life, whatever stage that may be, when you are not in need of your family medical history. It’s a matter of life and death in some cases. For some reason, the powers that be believed that once you put a baby up for adoption, they would never have need of their medical history. It was as if the bloodline simply vanished. I am starting to feel better. Now that I know what I’m dealing with, I can act accordingly. I’m no longer able to work, and spend much of my time taking care of myself. My health is now my top priority, which is a luxury most single working moms cannot afford. 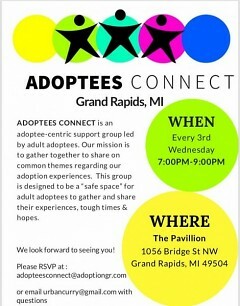 One of my most treasured tools for healing is my adoptee support group, Adoptees Connect in Grand Rapids. It’s hard to put into words what happens when you get a group of adoptees together, talking about being adopted, but it is magic. I know the people who love me want to be supportive, but unless you have been adopted, it’s impossible to understand what it’s like. We adoptees even have our own language. We talk about things like, “coming out of the fog,” “OBC’s,” confidential intermediaries, search angels, reunions, post-reunions, and DNA matches. We talk about our “first mothers” and ‘step-adoptive’ parents without having to explain what it means, or how it feels. We just get each other. My support group feels like a sacred space. Most importantly, we have gained priceless experience that we share with one another. I am now the “wise old adoptee,” with what I hope is good advice for those coming after me on this journey. The one I wished for back in 1988. But I am more than happy to be that person now, for all my adopted brothers and sisters, in whatever way I can. It’s an honor and a privilege to count myself among them. Adoptees Connect hosts a meetup on the third Wednesday of every month where adoptees are invited to meet each other and share their stories. Learn more about this month's event on Facebook.